Light City Festival begins Monday, March 28th. It’s crunch time. Artist Mina Cheon and her husband, architect Gabriel Kroiz, will be down at Pratt and President Streets on Thursday the 24th, whatever the weather, and for the next few days a crew of people will help them assemble 15 giant LED diamonds that comprise one of the most highly visible projects in this massive celebration of light and all its expansive metaphors. 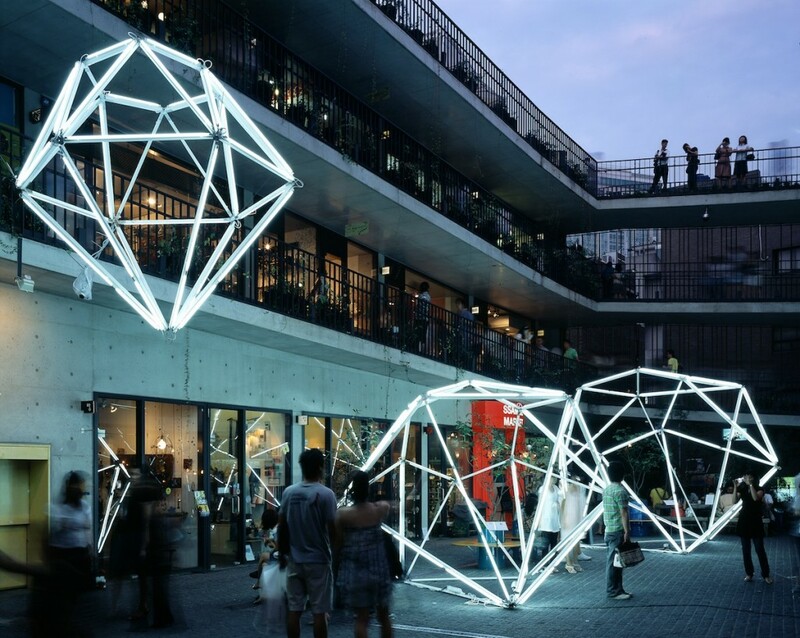 Almost a decade in the making, their project, Diamonds Light Baltimore, has been prototyped five times before, beginning with installations in Seoul, South Korea, a city that is the world’s 4th largest metropolitan economy after Tokyo, New York and Los Angeles. 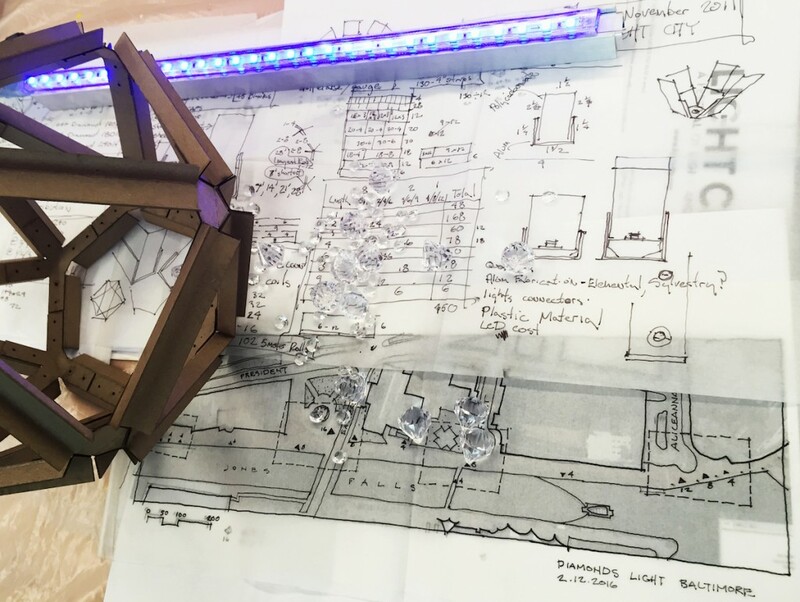 The Light City version of the project is being fabricated in and around Baltimore, with metal work being done in Rosedale, connectors coming from Elkridge, and partial assembly taking place at Cheon’s studio in Station North, in preparation for the final on-site construction downtown. 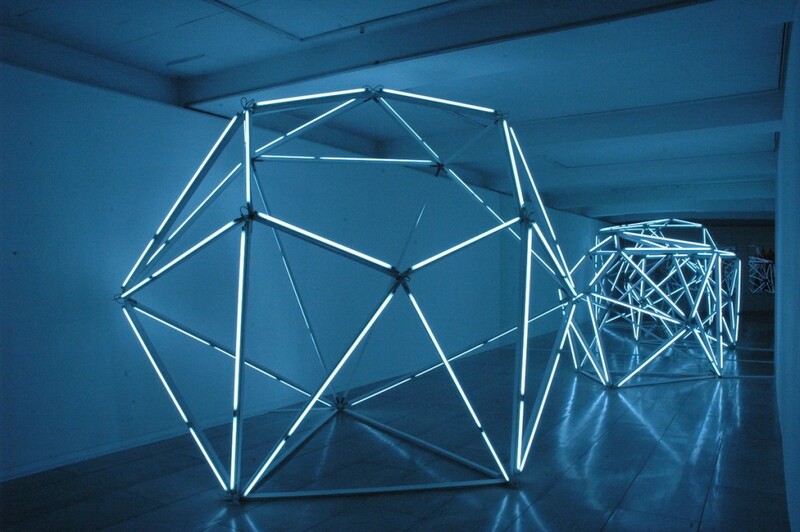 Earlier prototypes of these large diamonds were built with wooden frames, metal fixtures and fluorescent tubes, but the pieces weren’t weather-proof. 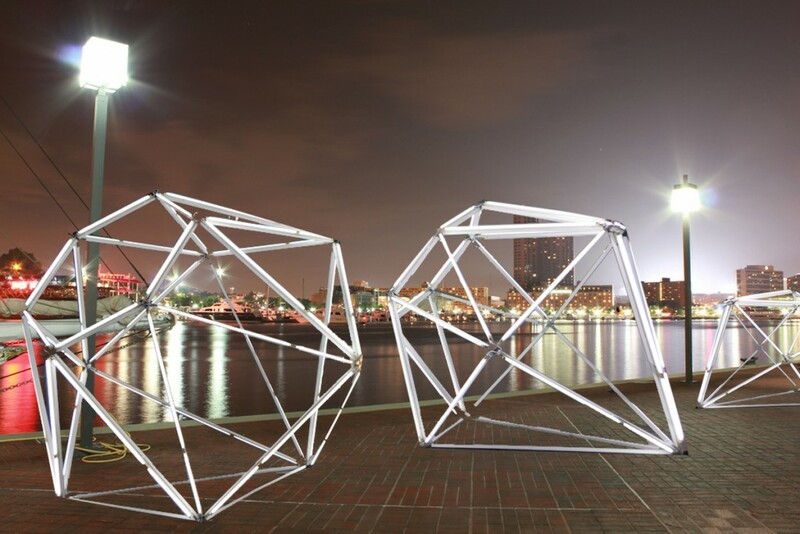 Their multi-faceted installation will occupy an extensive promenade down the west side of President Street to the waterfront at Harbor East, and will be visible from Federal Hill on the south side of the Harbor. With her art and design experience and her husband’s expertise as an architect, installation art has been the area where their skills and intentions converge, with frequent international large-scale public exhibitions, many of which deliver a powerful subtext of social commentary and conceptual communication. They debated installing the large diamonds in an orderly row, as opposed to a more unpredictable, scattered kind of arrangement that might feel more like a spontaneous discovery. The weekend before the festival, the final arrangement will unfold, along with dozens of other high-profile projects, a full schedule of diverse musical and theatrical performances, and an astounding array of innovation conferences with speakers from around the world. “It’s so great for the city to have this level of intensity in unifying so many different forms of art and innovation,” says Cheon. Many of the team’s past projects have carried powerful commentary about capitalism, racial and class conflict, and other controversial topics. It hasn’t escaped their notice that the largest light installation in Baltimore since 2005 has been a sprawling network of police blue-light surveillance camera posts that punctuate many of the city’s poorest neighborhoods. It is their hope that Diamonds Light Baltimore can present a positive contrast to such an invasive force. Perhaps the healing power of light can illuminate feelings of clarity, unity and optimism. Even as the conferences, performances and art installations are likely to spark new conversations about the hard issues confronting communities in Baltimore, these themes could make the Light City festival an uplifting experience for everyone.